I’m on to my second Daring Kitchen challenge, which is on the baking side of things. The July 2010 Daring Bakers’ challenge was hosted by Sunita of Sunita’s world – life and food. Sunita challenged everyone to make an ice-cream filled Swiss roll that’s then used to make a bombe with hot fudge. Her recipe is based on an ice cream cake recipe from Taste of Home. This has a few moving parts so it was recommended to do the challenge over two days. I’m no masochist so that’s what I did, and I’m glad. 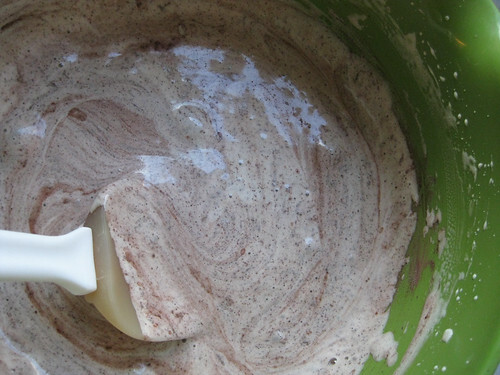 First you need to make a swiss roll, then two flavors of ice cream and hot fudge sauce. Once the various components are ready you have to assemble it into a bombe. This was a good challenge for me since I haven’t made a sponge cake swiss roll since my childhood days helping my mom make Bûche de Noël for Christmas, and I have never made ice cream before. The first hurdle for me in my rented kitchen was the fact that I didn’t have any baking pans. I headed out and bought a 20x26cm pan, which I’ll end up leaving behind with friends since that is a bit much to pack in my bags. The second item that I had to sort out was caster sugar. I ended up doing my shopping at the end of the day on Saturday so my store options were limited (things really shut down in Copenhagen in the evening, especially on the weekend). No caster sugar at the store. I’m not even sure if they sell it here. Luckily that is an easily solved problem if you can grind up some regular sugar. Camilla had left her fancy new immersion blender here which has a mini food processor attachment. I used it quite a few times for this challenge and pretty much fell in love with it (that may end up being a purchase that I do pack with me when I leave). OK, so prerequisites accounted for, I was ready to rumble. I decided to make only half the recipe because I don’t have an army to help me eat all this stuff and I only have a mini fridge with a teeny tiny freezer in it, so small is all I can manage. It has been a long time since I made a sponge cake and I was shocked at how simple the recipe is: only four ingredients. The main point of concern for me was that I couldn’t seem to get the batter thick enough. I was super glad that my immersion blender had a whisk attachment because I didn’t have a regular electric mixer, and this beating of the sponge cake took forever. After 15 minutes of whisking away, I finally gave up and decided it would have to be good enough. It seemed that the batter was the same thickness it had been at 10 minutes in. It was thick-ish, just not as thick as the recipe seemed to be asking for. I was a little worried that my challenge was doomed already. I baked it up anyway and in the end, it came out great. After the cake came out, the rolling and cooling part went as planned. While it cooled I made the whipped cream filling and tried to not keep eating it. I am a little bit of a homemade whipped cream addict. I have to say that I’m not used to making whipped cream with sugar, so I found it a little too sweet and would leave the sugar out next time. Once the roll was cool, I filled that baby and rolled it up. The swiss roll was the part I was most nervous about, but everything came out really well and I could totally see myself whipping one of these up on its own for dessert in the future. Having never made ice cream I was a bit skeptical that I could do it without an ice cream machine. The challenge specifically did it without one though since that is a rather specialty tool. It was surprisingly easy and successful. Basically it just involved mixing up sugar and whipping cream, and freezing it while stirring it over a number of hours. I didn’t really plan that out as well because I started the ice cream in the evening and it does take quite a few hours for the whole process. So I was up a bit late tending my ice cream, and I ended up just letting the chocolate freeze without enough stirring. Oh well. But hey, it worked and was still tasty. It was a fun process, but I’m not a huge ice cream freak, so I imagine that in the future I’d just buy ice cream when I want it. One thing that raised my curiosity a bit was the fact that the vanilla ice cream was very straight-forward in that you mix the ingredients and pop it in the freezer, but the chocolate ice cream had you cook it first. I searched about around Google but didn’t really come up with anything useful. I assume it is to better incorporate the ingredients, but if anyone knows for sure, I’d love to know (my geek brain needs to know!). In the midst of constructing the bombe the next day I made the hot fudge sauce. It was super easy to make, though I feel like it didn’t come out thick enough. Next time I’d probably cook it longer to get a thicker sauce. I’d also likely reduce the sugar some because, again, this was more sugar than chocolate for my liking. Crazy how my tolerance for super sweet stuff has gone down over the years. Anyway, sauce made, I had all of the pieces in place. I got the swiss roll and ice creams made on Saturday and waited until Sunday to actually finish it and build the bombe. This lead me into another little limitation I have in my kitchen, literally. I only have a mini apartment fridge, and therefor, a mini freezer too. 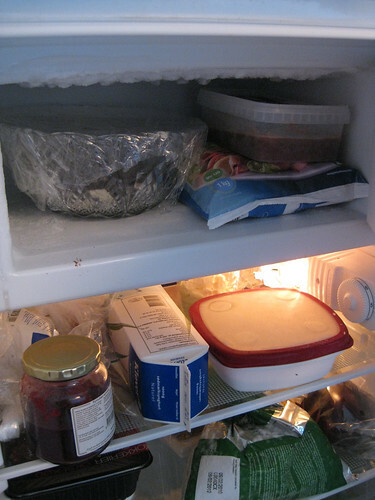 I’ve never had to work with this little freezer space before and it is definitely a bit of a challenge at times. I also have a very limited selection of bowls to choose from. I pretty much had one bowl I could use that would fit and I had to remove most of the food I had in the freezer to get it in. I picked the least critical frozens and moved them down to the refrigerator. The ice cream needed to be softened anyway, so out it went, along with some frozen corn and my cryogenic cookie dough. At this point I was pretty happy that I’d decided to go with a half recipe for a smaller bombe. There is no way I’d fit a bigger one in there. Now that I had a bowl and some space, I sliced up the swiss roll and set my first layer down. Adding the ice cream layers was easy, and while the vanilla layer was setting I made the hot fudge sauce. I let the vanilla layer sit for over an hour and then added the fudge sauce. It turned out that the ice cream wasn’t really hard though, so the sauce ended up mixing in with the sauce. Oops. Not very distinct layers here. I have the feeling that my tiny freezer also just isn’t very cold or efficient and it took a loooong time for things to set up. They sort of never really got hard frozen between layers. Then again, maybe I’m just impatient. After I had my bombe constructed I let it sit and freeze for about five hours. Finally, it was really frozen. After dinner I brought it out of the freezer and needed to do a bit of coaxing with a cloth soaked in hot water around the outside of the bowl. It came free and I carved it up. Overall, it was hit, and the layers ended up being more distinct that I had thought they would be. It came out great. 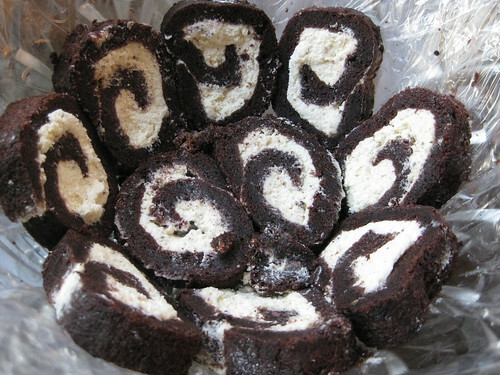 For me, personally, the swiss roll was the winner. 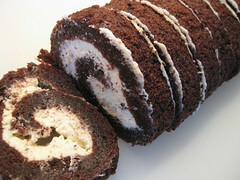 I’m more inclined to whip up a swiss roll for an interesting dessert now. If I made this ice cream cake again I’d most likely buy ice cream at the store, unless I wanted to make something that is harder to find, like cardamom ice cream (mmmm). Great to know that I can make ice cream on my own though. I pretty much followed this one to the T, except for making only half portions. 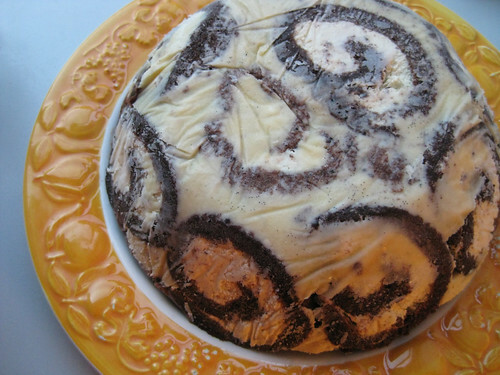 So instead of reprinting the recipe here, I’ll just point you to the original Swiss Swirl Ice Cream Cake recipe.